Yamame Kashasha, 92, passed away on December 26, 2018. 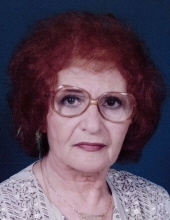 Yamame was born in Lebonon to the late Daoud and Rahme (Hanna) Kashasha and lived in the Akron area most of her life. In addition to her parents, Yamame is preceded in death by her sisters, Laurice Zarzour and Yvone Zarzour. She is survived by sister, Therese Kashasha; brothers, Mike Kashasha, Antoine Kashasha, Joe (Laura) Kashasha, and Sleiman (Rose) Kashasha of Lebanon. Funeral Service will be Monday, December 31, 2018 at 10:30 am at Hennessy-Bagnoli-Moore Funeral Home, 936 North Main Street, Akron, OH 44310 (corner of N. Main St. and Mildred Ave.). Visitation will be Sunday, December 30, 2018 from 4:00 pm - 8:00 pm at the funeral home. Yamame's final resting place will be Holy Cross Cemetery. You are invited to hbm-fh.com to view Yamame's tribute wall, offer condolences and share memories.